On 26 October 2016 the world went nuts with the news that ABBA would return “in a groundbreaking venture that will utilize the very latest in digital and virtual reality technology”. Though the original media release made it fairly clear that it’s going to be some form of virtual reality technology, hinting at “hyper-realistic digital humans”, and that the group members would “collaborate”, some fans and most media outlets made the assumption that the original four would reform (in 2018, a year that isn’t mentioned in the media release), and/or that there may be new ABBA music. But what exactly will this “new entertainment experience” be? It’s not really clear. The most common assumption is some form of hologram performance, as there have been for artists like Elvis Presley, Tupac, and Michael Jackson. Or it could be a VR app. Or it might be both. When fans asked Benny about it at a concert in Norway this week, he responded “it’s going to be huge”. My guess: some form of entertainment with ABBA hologram figures, based on the holograms and life-size figures currently at ABBA The Museum, “performing” well-known ABBA hits, limited to the ABBA Gold tracklist. We will have to wait for sometime in 2017 for more news. 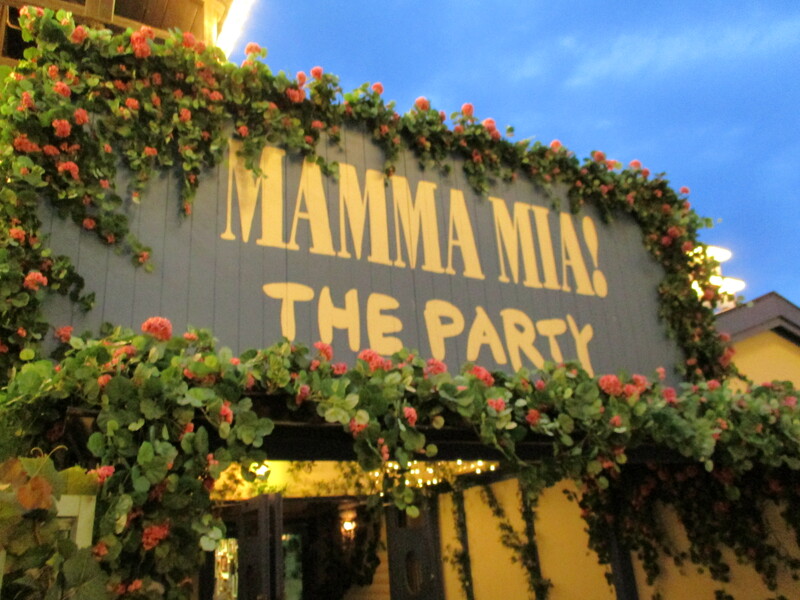 A few weeks ago while visiting Stockholm, my partner and I attended Mamma Mia! The Party. We both went in with low expectations. I’m not a fan of the musical, though I find the movie enjoyable, thanks mostly to the high calibre of the actors. My partner isn’t an ABBA fan at all, but tolerates it. We were both happily surprised at how much we enjoyed the night. It was exceptionally well produced. The cast were part of the restaurant staff, and the wait staff at times were part of the show. The premise of the show is that after the movie crew left the Greek island of Skopelos, Nikos, a local tavern owner decided to capitalise on the tourist influx by hosting a Mamma Mia! themed party at his taverna. He has married Swedish woman Kicki, who worked on the movie. Meanwhile Nikos’ daughter Konstantina has fallen in love with Kicki’s son Adam. Much drama and singing ensue, but of course there’s a happy ending and love prevails. The action is not centred on a stage, but fully immersive, with the actors and musicians performing all over the room, including a couple of songs when the band was up on a landing overlooking the main room, right next to our table. The party features 23 ABBA songs, including songs and album tracks not featured in the musical and movie, plus of course several hits that are in the musical (see below for the full list). What surprised me was that many lyrics, particularly in the first act, have been extensively rewritten for the story. The show ends with a megamedley of eleven ABBA hits to get the audience up and dancing. Before the first act the starter and entree courses are served, with the main meal served between the first and second acts. Dessert is served after the second act and before the finale. The food is a Greek banquet, shared with all the guests at each table. All the food was excellent quality, and there is plenty for everyone. Beer, wine, and ouzo help get everyone in the mood for a fun night. The atmosphere of the venue enhances the mood. The set looks just like a beachside Greek taverna, with lighting and other effects cycling from afternoon sun through sunset and into the night. One thing I think is strange is that the show is performed in Swedish, with the songs in English. During August the show was performed entirely in English. I feel this would limit the tourist market. There’s no reason why it couldn’t be performed in English once or twice a week for non-Swedish visitors. Sunday 5 June 2016 marked the 50th anniversary of the first meeting of Björn Ulvaeus and Benny Andersson. A chance meeting that became a firm friendship and songwriting partnership that endures to this day. In a room filled with 300 or so invited family, friends and associates at Berns Salonger in central Stockholm, Björn and Benny celebrated the anniversary with a night filled with music, memories, and fun, arranged in secret by Benny’s son Ludvig Andersson, Görel Hanser, stage director and BAO member Lars Rudolfsson, and Master of Ceremonies Claes af Geijerstam. The night featured an audio-visual presentation of Björn and Benny’s career. Interrupting the presentation were musical performances by guest singers, backed primarily by Benny Anderssons Orkester (without Benny), revisiting Björn and Benny’s vast catalogue. Hep Stars lead singer Sven Hedlund sang Björn and Benny’s first song ‘Isn’t It Easy To Say’, apparently the first time he has ever performed the song live; Peter Jöback and Lill-Babs duetted on the Björn & Benny single ‘Det kan ingen doktor hjälpa’; Ludvig sang ‘Rock Me’ while his half-brother Peter Grönvall joined the band on keyboards; Pernilla Wahlgren and Lena Philipsson sang ‘Hole In Your Soul’; Helen Sjöholm sang ‘Where I Want To Be’ from Chess while Tommy Körberg sang BAO’s ‘Du är min man’, a reversal of their usual songs. Apparently there were other performances, but details haven’t been made public. Paul McCartney sent a video greeting congratulating the pair on their long relationship and continued success. Björn and Benny have often professed that they were inspired to write songs, separately and together, by the example of Lennon and McCartney and The Beatles in the mid-1960s. The night climaxed when Björn and Benny took to the stage to perform ‘Does Your Mother Know’, Björn handling lead vocals while Benny joined in on keyboards. After they returned to their seats, much to everyone’s surprise Frida and Agnetha were introduced to sing ‘The Way Old Friends Do’, dedicated to their old partners. Just as they did in 1979, Frida sang the first lines, Agnetha sang the next lines, then the two joined together in harmony. After the song, Björn and Benny returned to the stage for a brief emotional reunion. With the formal events of the evening over, BAO took over with dance music until late in the evening. Immediately the news of a so-called ABBA reunion flashed around the world. Unfortunately, as the story spread, it became more and more wrong about the events of the evening. It was also widely reported that Björn and Benny joined the women on stage to sing, for an “ABBA reunion”, but that didn’t happen. The two men only returned to the stage after the song had finished. All the photos of the four together on stage on social media and elsewhere were taken in the minute or so after ‘The Way Old Friends Do’. Pretty much every story stated that this was ABBA’s first public performance in 30 years. It was neither. The last (known) time the four sang together was 17 years ago, in June 1999 at Görel Hanser’s 50th birthday party. Prior to that they had also sung at Claes af Geijerstam’s 40th birthday party in 1986. Neither of these were public events, but like Sunday’s gathering, private parties for invited guests only. After three decades of avoiding appearing as a group, this marked the second occasion that the four had been seen together this year. In January the four appeared on stage briefly at the opening of opening of Mamma Mia! The Party. Does this mean that a formal ABBA reunion is in the works? Of course not. On every occasion they’ve been together since 1982, it has been some private celebration, without media and fans present. The life and career of Agnetha are celebrated in Daniel Ward’s new biography Agnetha Fältskog – The Girl With The Golden Hair. Though unauthorised and thus with no direct input from Agnetha or those close to her, the book is extremely well researched. All phases of Agnetha’s life are covered, from her early childhood when she first fell in love with music, her infamous first public performance aged five, singing on the dance band circuit, her solo recording career, through the ABBA years, and on after ABBA, to her 2013 album A and beyond. The Girl With The Golden Hair is well written and an enjoyable read. It’s very respectful and not sensationalist in any way. The unfortunate episodes of Agnetha’s later life are not avoided, as they shouldn’t be, but they are covered delicately and with respect. There is also a photo section, with many familiar but some lesser-seen photos of Agnetha through her life – a few that I don’t recall seeing before. I was honoured to be asked to read a draft version of the book. I’m happy to see that I was able to make a contribution to the finished product. Daniel has also written ABBA – The Quiz Book, as well as crime fiction and articles for medical publications. If you are a fan of Agnetha, I’m sure you will enjoy this book. More information can be found at the publisher’s website. Forty years ago this week, in the middle of ABBA’s promotional trip to Australia, the brand new single ‘Fernando’ was released. This was the first new music from ABBA since the phenomenal breakthrough with ‘Mamma Mia’ and the other singles from the ABBA album the year before. The single’s release was highly anticipated, especially coming with ABBA’s first visit to the country. ‘Fernando’ had its Australian television premiere not on a pop music show, but on the news program A Current Affair on Friday 5 March, when Lasse Hallström’s now famous film clip was shown as part of a report on that day’s press conference at the Sydney Hilton Hotel. ‘Fernando’ hit record shops and radio stations from Monday 8 March. On that day, in the singles chart ‘Ring Ring’ was at number 14 (on the way up), ‘SOS’ was at 16, and ‘Mamma Mia’ was at 29 (both on the way down); the ABBA album was at number 4 (on the way down), The Best Of ABBA at 12, Ring Ring at 40, and Waterloo at 76 (all three on the way up). ABBA had travelled to Melbourne to perform ‘Fernando’ and ‘SOS’ on The Don Lane Show. ‘Fernando’ entered the singles chart at number 75 the following week, on 15 March. Three weeks later, on 5 April, it reached number 1, where it stayed for the next 14 weeks. It replaced Queen’s ‘Bohemian Rhapsody’ at the top spot. ‘Fernando’ equalled the previous longest running number 1, The Beatles’ ‘Hey Jude’ in 1968 (Note: There was no standard national Australian chart until ARIA in 1983. Some charts quote different weeks at number 1 for both songs. These figures are from the generally accepted authoritative chart, the Kent Music Report). ‘Fernando’ was a highlight of the locally-made TV special The Best of ABBA, which was the prime reason for ABBA’s visit to Australia. In fact, both sides of the single were featured in the special, with Frida dedicated the B side ‘Tropical Loveland’ to Australia, “that is, when the cyclones aren’t blowing of course”. On both the Don Lane Show and The Best Of ABBA, Agnetha and Frida wore the same folk-style dresses they had worn in the film clip. 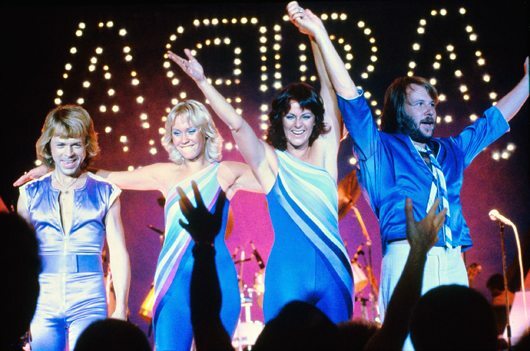 The screening of the special not only helped push ‘Fernando’ and The Best Of ABBA to number 1, but also several older singles and B sides into the chart, to the point where for two weeks (19 and 26 April) there were 5 ABBA singles in the top 40 (‘Fernando’, ‘Ring Ring’, ‘Rock Me’, ‘SOS’ and ‘Mamma Mia’; ‘Hasta Mañana’ would enter the chart on 10 May, by which time ‘Mamma Mia’ and ‘SOS’ had left the top 40, but were still in the top 100), and for 12 weeks (26 April to 12 July) all four ABBA albums were in the top 40 albums. During ‘Fernando”s run at number 1 there was some criticism that it had remained at the top for so long. Popular TV music show Countdown didn’t play the clip as the number 1 song every week, instead sometimes replacing it with another top 10 entry or predicted future chart hit. One week when ‘Fernando’ was actually shown, that week’s guest host John Paul Young, whose ‘I Hate The Music’ had been stuck at number 2 for several weeks, donned a long blonde wig and emoted to camera when the show cut to him during the clip. That footage has never surfaced, but I’m sure I’ve seen footage from the same episode in recent documentaries on Countdown. If there is a starting point to the backlash over ABBA’s overexposure that led to the alarming drop in ABBA’s popularity after the 1977 tour, this would be it. ‘Fernando”s last week at number 1 was 5 July. The following week it was replaced by Sherbet’s ‘Howzat’, which led to many newspaper stories gloating that a local act had knocked the mighty ABBA off the top. But really, ‘Fernando’ couldn’t stay number 1 forever, so something was going to replace it eventually. ‘Fernando’ remained in the singles chart for a total of 40 weeks, until 13 December, its last placement at number 93. 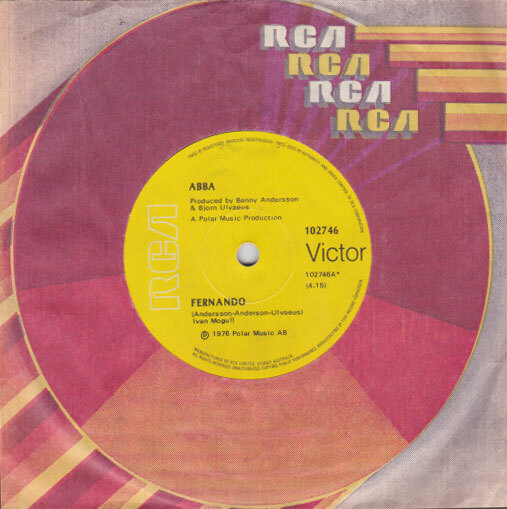 RCA reported that ‘Fernando’ sold 400,000 copies during 1976. This was the highest selling single ever in Australia to that point, a record that would remain for a little over twenty years, until Elton John’s ‘Candle In the Wind 97’, which sold over 980,000 copies. Today in the age of cheap music downloads, sadly a few dozen songs have now outsold ‘Fernando’, but the population of the country has increased by over 70% since 1976. ‘Fernando’ entered the Australian vernacular, with the phrase “Can you hear the drums <insert name here>?” often quoted or used as a headline for instant recognition to this day. Personally, ‘Fernando’ was the first newly released ABBA record I got that I had never heard. I’d missed that first TV screening of the clip (I was out at the roller skating rink), and it hadn’t had any radio airplay before the record hit the shops. 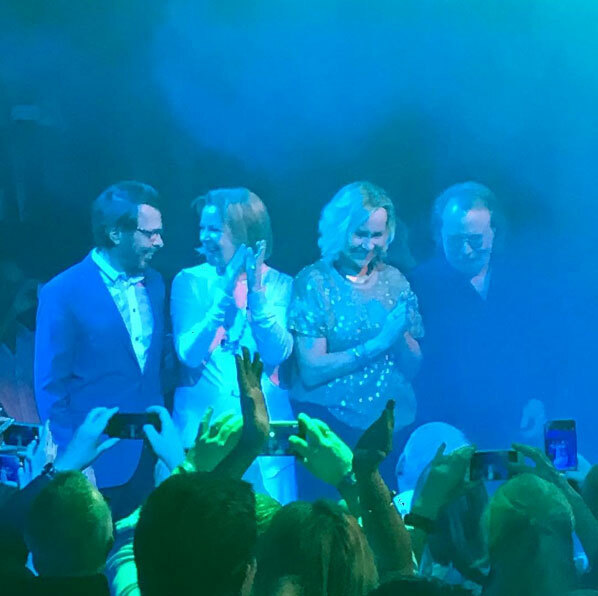 Much to everyone’s surprise, not only did Bjorn, Frida, Benny and Agnetha attend the opening of Mamma Mia! The Party at Gröna Lund in Stockholm on the evening of Wednesday 20 January 2016, but the four appeared together on stage, posing and waving (briefly, for about 20 seconds or so). 2015 has been a slower year for ABBA, but there have still been many ABBA events, as well as things happening with Frida, Benny and Björn. What have been your favourites? Vote below for as many as you like. Please add any other events in the Comments. Forty years ago today I got my first ABBA record, the self-titled album released in 1975. 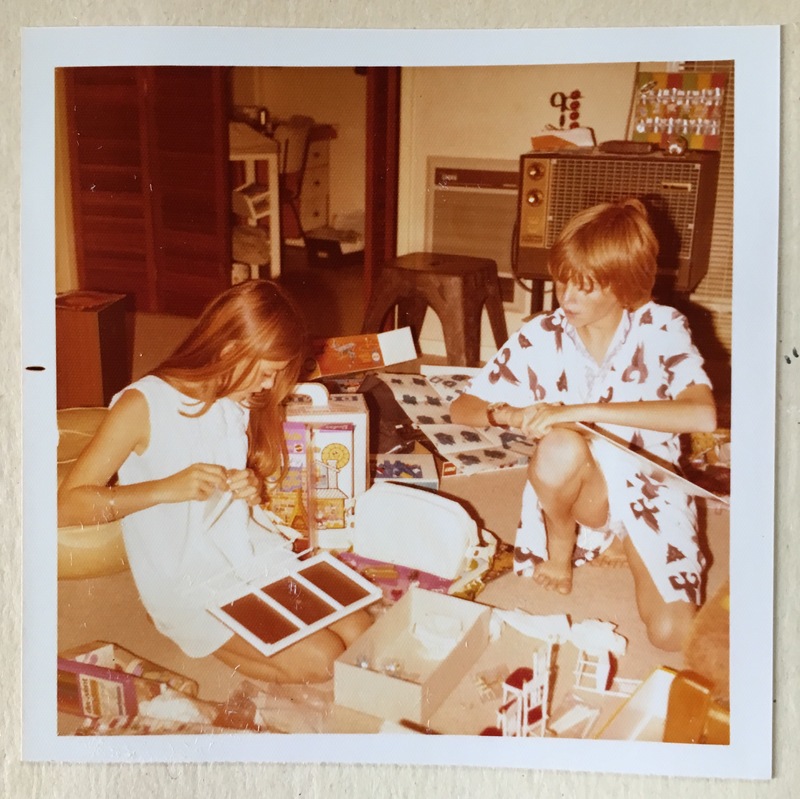 The photo shows my sister and I on Xmas Day 1975. I’m holding the ABBA album, not that you can tell. Our father liked to take candid snaps, rather then posed photos, so sadly there’s no photo of me holding the album properly. The following year there is a photo of me with an ABBA bag in the foreground. Having fallen for ABBA after hearing ‘Mamma Mia’, I’d asked my parents for the ABBA album for Xmas. I’ve written before about getting the album before here, and how I first fell in love with ABBA here. Getting the album was the start of my ABBA fandom. From this point I collected every album and single, newspaper and magazine clippings, watched every ABBA special on TV, listened to the radio waiting for ABBA songs. A highlight of course was going to ABBA’s first concert in Sydney in March 1977. Twelve-year-old me had no idea that forty years later I’d still be loving ABBA, have made so many friends (sadly lost a few along the way), and experienced so much through the love of ABBA. Forty years ago this month Polar Music released ABBA Greatest Hits in Scandinavia. In the same month, RCA in Australia released its own compilation, The Best Of ABBA. Polar had been motivated to release its album when copies of compilations from West Germany (The Best Of ABBA) and France (ABBA’s Greatest Hits) started appearing in Swedish record shops, which I wrote about in an earlier blog post. The Australian album took the same title and track list as the West German album, but with a different sleeve, though the designer is uncredited. It was possibly F.H. Booth, who designed the cover for the re-release of Ring Ring, released in the same month, and other RCA sleeves in that era. 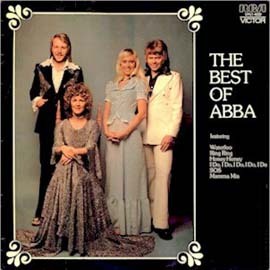 Initially The Best Of ABBA was released only in the states of South Australia and Western Australia. Though these two states had about 15% of the nation’s population at that time, the album entered the national charts at number 72 in December. In February 1976 the album was released in the rest of the country. After ABBA’s visit to Australia in March, when the group made the tie-in TV special The Best Of ABBA, the album reached number one and stayed there for 16 weeks. It remained in the top 100 albums chart until April 1977. The album went on to be the first album ever to sell over one million copies in Australia, selling 1,010,000 copies during 1976 alone. For many young ABBA fans in the 70s, this was their first ABBA record. It was my third ABBA record, after the ABBA album and ‘I’ve Been Waiting For You’ single. Despite these amazing figures, for many years The Best Of ABBA had been forgotten in media reports about the biggest selling records in Australia; primarily because writers based their figures on ARIA accreditations, which only covered the period from 1984. In recent years The Best Of ABBA has reclaimed its place in the list of biggest-selling albums in Australia. But unlike the other biggest sellers – Bat Out Of Hell, Whispering Jack, Brothers In Arms, Thriller, and <ahem> ABBA Gold – The Best Of ABBA has not had multiple re-releases, and is no longer available, having been out-of-print for over 25 years. A 1988 re-release on LP and CD barely counts, adding just over 10,000 copies to its total sales.